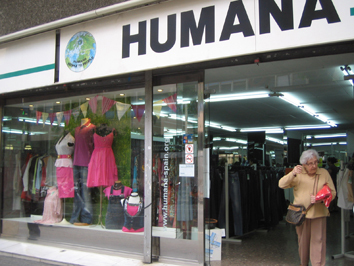 Between February 21st and April 18th, all unemployed people who visit any of Humana’s 20 stores in Barcelona and its metropolitan area (10), Madrid (6), Granada (2) or Seville (2) on Mondays may benefit from a 50% discount on all purchases. To take part in this promotion, you only need to show your jobseeker identification card. Through this promotion, the Fundación aims to offer those who are not currently working the chance to buy clothes at an even more competitive price. In addition, February 7th witnessed the arrival of all items in the Humana stores. As spring approaches, it's time to start thinking about the new season. What better way to do that than by visiting some of the Fundación’s stores, where you can also donate those items that you’re no longer going to use? The proceeds from the sale of used clothing allow Humana to help fund cooperation projects in Africa, Latin America, and Asia in the fields of education, the prevention of contagious diseases such as HIV/AIDS, community development, and agricultural and rural development.